mairuru: !!!! Giveaway winners !!!! Hi everyone. 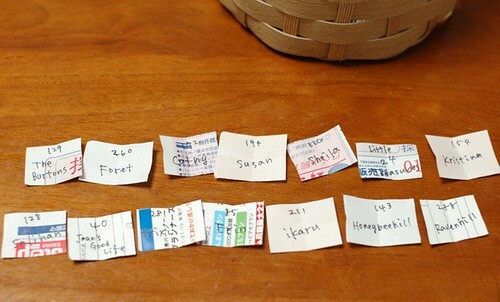 Last night I wrote down your names (299 names) on a small piece of paper and Haru picked lucky winners. Today I made packages for them all. I enjoyed choosing one by one reading each comment. 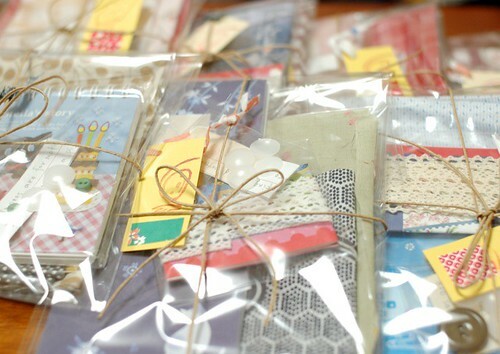 The first prizes include a book, fabric scraps, stamp tags, trims, Sashiko threads and little extra. The first winner for it is "The Burtons". I put a book of making clothes for kids. The second winner is "Forêt". 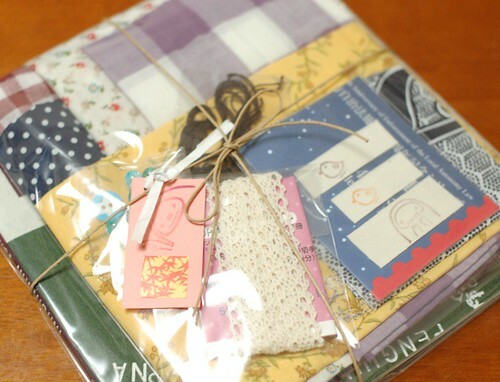 I put Sashiko threads for her (* v *)!!!! The third winner is "Cathy". 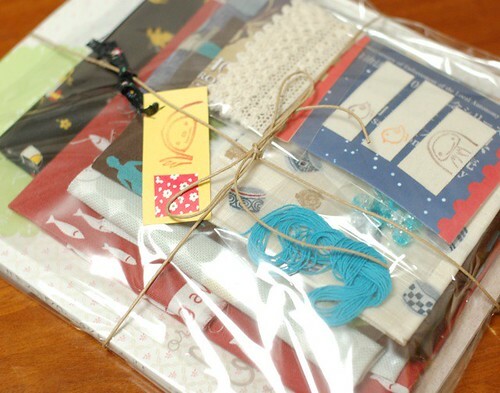 I put cute motif book and my favorite cotton linen fabric from SWANY. The forth winner is "Susan". I put a book of beautiful embroidery and a little lemon charm. The fifth winner is "Sheila". I put cute dog plush book and my favorite Lucien fabric. The sixth winner is "Little Treasures". 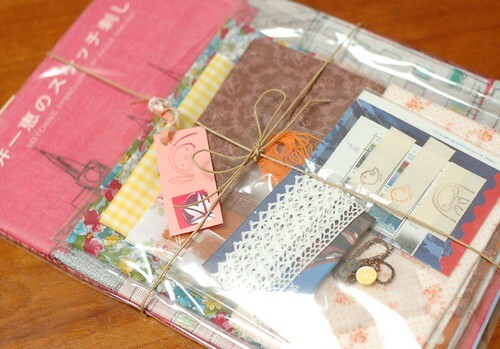 I put cute idea sewing book and my favorite green lace. The last winner for the first prize is "Kristina". 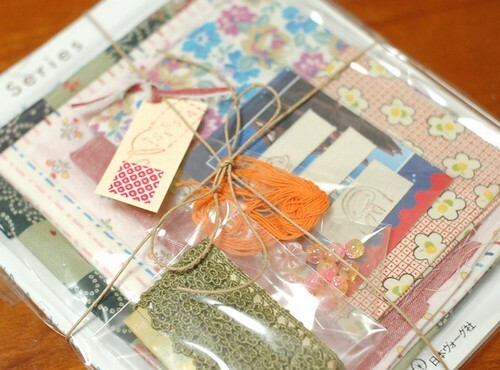 I put the book of cute plushes and my favorite flower printed fabrics. Then, here are second prizes. 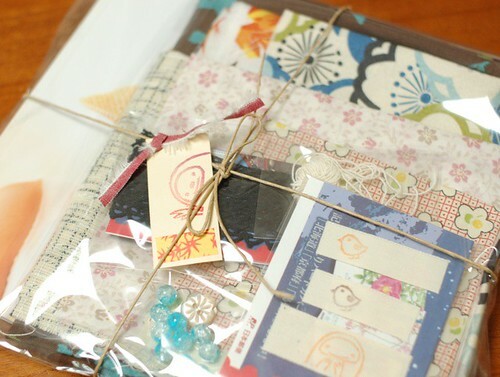 I put Japanese paper items, fabric scraps, a piece of trim and little extra for each. The seven winners for it are "Salihan", "Joan's Good Life", "trixi", "Erin", "ikaru", "Honeybeehill" and "Ravenhill". I couldn't believe it when Haru picked the last name (Ravenhill) because I know her already. I'll contact the winners through their blog or e-mail what I know. But I cannot access Forêt, Cathy and ikaru (I couldn't leave a comment on your blog!!!!). If you read this, please send me your address to "maimairuru(at)gmail(dot)com". I'm sorry for others but I enjoyed this giveaway at all. Thank you very much again for your entries. This is the "arm covers(I'm still thinking of the name...)" with my arm. I forgot to ask Haru to take pictures so I tried them by myself. Could you see how to use them? I made this lunch box with my arm covers (* v *). 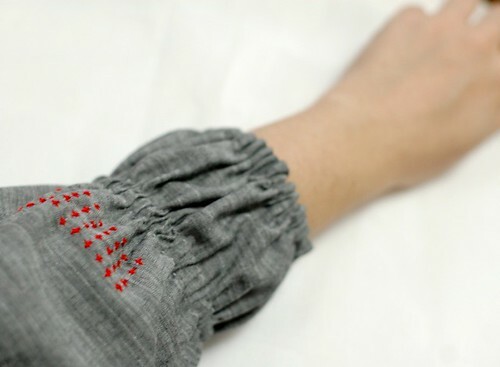 In next post, I can show you how to make the "arm covers". Wow! 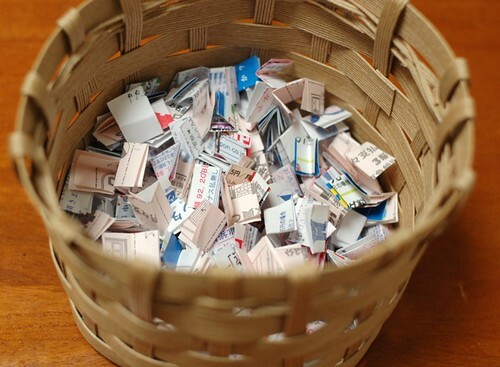 Next time you have a giveaway - I am definitely entering! You are so generous. As to the arm covers - those photos don't do them justice. Have Haru help you, maybe while you are making those delicious bento boxes. Yummy! what lucky giveaway winners! can't wait to try again next time! 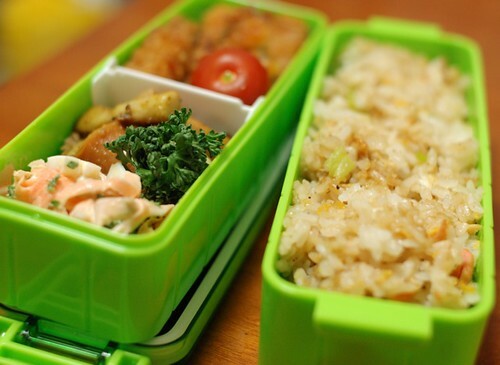 I like your bento boxes.It´s looks yummi. You are so nice mai...and your arm covers are really cute and very useful too..
By the way I made Sarubobo brooches and gave it to my friend and my sister..they love it. Thank you so much for the idea. And the arm Covers looks great too. Congratz to the lucky winners! Oh sweet emily (Ravenhill) is soo lucky hehe. I am really loving all your gorgeous packages and those lovely arm covers. Yipeee and hooray to your next post of showing us how to make them! Thank you so much sweet Mia! Have a lovely merry happy day and love to you, Haru and tomato. CONGRATULATIONS you lucky winners!! XD please make beautiful things with those marvelous items! Oh, so lucky they are. All your works are excellent. wow- lucky winners ;) what a nice give-away! but i'm happy for those winner..
About your cover arms, they are lovely, by the way, in portuguese we have the word "polainitos" but I don't know the word in english! And I'm looking forward for the arm cover tutorial! A Danish legend :-) and she always wore this kind of sleeves when she was on television teaching the nation how to cook! Congratulation to the very lucky winners!!! Congratulations to the winners. I've never seen such a wonderful giveaway!! I think "arm covers" is a good name. Why not? Thank you from the depth of my heart for the loveliest prize! Everything inside looks gorgeous! Lucky winners!!! You are really generous. I love the picture of your arm covers, thank you! Hi Mai, thank you so much to be one of the lucky winners. You are so generous and much too kind. To all the other winners, congratulations! hi! thanks for the tutorials, i could make some nice sarubobo myself, and some other things. by the way can i add a tutorial on them in hungarian on my blog? It's been a pleasure to take part, you are simply adorable! Congrats to all the winners, lucky girls :-) !!! Hello Mai! I am so excited to be one of the winners picked! I never win anything, and I am so happy your giveaway is the exception! oooh I'm so so jealous! I can't wait to read your next post, I love your blog! Congratulations to all the winners! The packages all look so nice. What a wonderful thing to do. The arm covers are very pretty and that lunch box looks yummy. The lunch you made looks delicious and I can't wait to learn how to make the arm covers. All day yesterday I thought of making some for myself! What lucky winners. You are very generous Mai. Your arm covers look lovely on you and what a delicious lunchbox you packed. It will be for next time... your prizes are wonderful and you are very generous! Mai: I was talking to my daughters about your blog and my oldest daughter came up with another name for your arm covers: Forearm Shields!!!! I am really impressed by the beautiful give-aways you put together. Lucky winners! I think arm covers are a brilliant Japanese invention. I have never seen them outside of Japan although they are great for protecting your clothes when cooking or gardening. Looking forward to the tutorial! All the best for Tomatoe and you. I am 7 months pregnant and share your sense of excitement and happiness. Oh, Mai, I 'm not the winner but It's ok, maybe next time. Congratulations for all the winner. They are called sleeve protectors in the U.S. Yea!!! Happy day! Thank you so much for the wonderful news! I am thrilled - you are the sweetest! Your arm covers are so pretty. I adore those little stitches and thank you for sharing all that you do! These parcels are soo amazing. I can imagine the sheer happiness when the lucky winners open their mail. Your lunch box looks really jummy. I'd love to see more of your bento boxes, if you feel like it. Hello Mai! I just found your blog through be*mused. Its lovely and I will put a link on my blog. Thanks! Love your work, love your blog, love your sharing, love japanese - I tell you, I love just about everything about you and your work!! You are such a darling, Mairuru. I love you!! Congratulations to all the lucky giveaway winners! 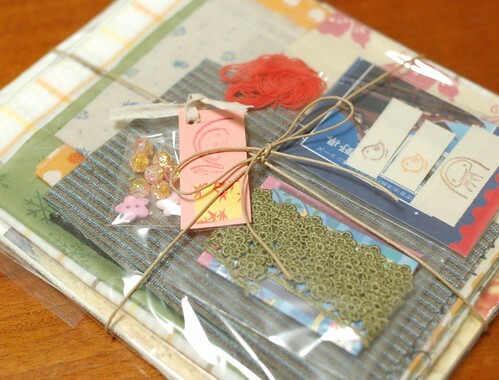 Mai, I just got your beautiful package in the mail! We all oohed and aaahed over all the lovely things! And the doggie pattern book is amazing!! I love those tiny tiny dogs and I hope that my daughters will sew them with me! You are a dear! I just wanted you to know it got here safely! Blessings to you and your sweet *tomato*! 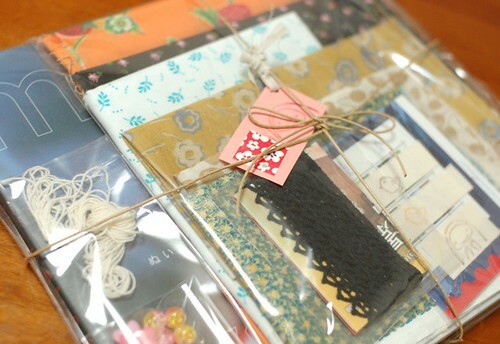 like your blog so much!~ and japan really can get many nice fabric. in malaysia is hard to find. Quite worthwhile material, thank you for the post.